Cold weather calls for a few things: cozy clothes, fireplaces, and vegan buffalo wing mac and cheese. 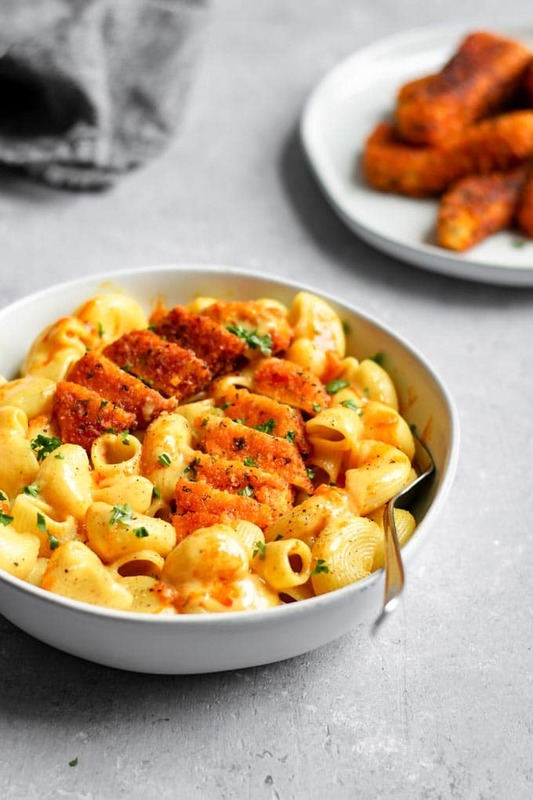 To be fair, I would argue that warm weather calls for my tofu buffalo wing mac and cheese too. Some foods are too delicious to save for just one season! I think you’ll understand once you try this recipe for yourself 😉 . I have a minor (major) obsession with all things buffalo sauce and all things creamy, cheesy noodles. So it was only a matter of time until I combined the two foodie loves of my life into one epic entree! And before I knew it, we ate the dish 3 times over the course of one month. It’s that good. Making the tofu wings and cheese sauce couldn’t be simpler, and it makes enough to serve a crowd! It’s the perfect game day recipe, and ideal for showing your family that you do eat more things than salad. I’ll admit, sharing such mouth-watering food can be hard, even with loved ones, so you’ll be happy to hear that leftovers reheat well! The wings crisp back up on a hot, dry skillet or in the oven/toaster oven. When it comes to making your recipes the best they can be, ingredients matter. I’m a big fan of Edward & Son’s and keep a lot of their products stocked in my pantry at all times! 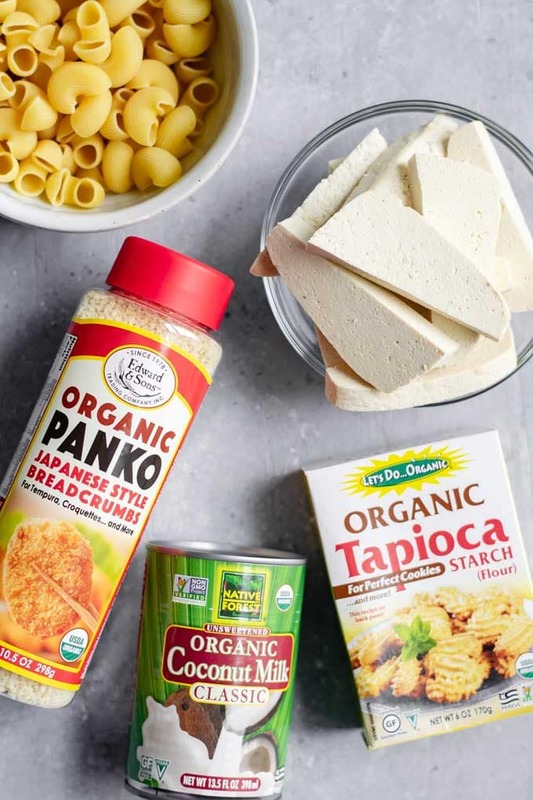 It’s easy to make delicious recipes with organic, good for you ingredients with their expansive line of vegan friendly foods. I was really excited to partner with them to bring this recipe to you. 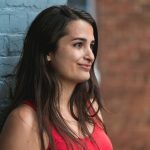 I look for every excuse to eat my vegan buffalo tofu wings, and judging by the fact that is one of my most popular recipes on the blog I think you guys feel the same way! And while they make a great appetizer or snack, I must admit I love them that much more atop mac and cheese. To make them, first choose extra firm or super firm tofu. If you choose extra firm tofu, squeeze out some of the excess water to make the tofu less wet and delicate to handle. Slice the tofu into 6 slabs, wrap in a lint-free towel or paper towel, then set something heavy over the tofu for about 20 minutes before cutting them into their final “wing” shape. This step can be skipped with super firm tofu. Next get together a workstation with three bowls/plates. In the first, put Let’s Do Organic Tapioca Starch, then a splash of plant milk in the next, and the breadcrumb mixture in the last. For the breadcrumb coating I love to use Edward & Son’s Organic Panko Breadcrumbs. 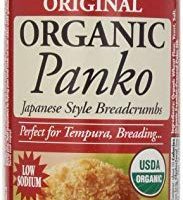 Compared to regular breadcrumbs, panko makes for an extra crispy vegan wing and is my preferred choice. 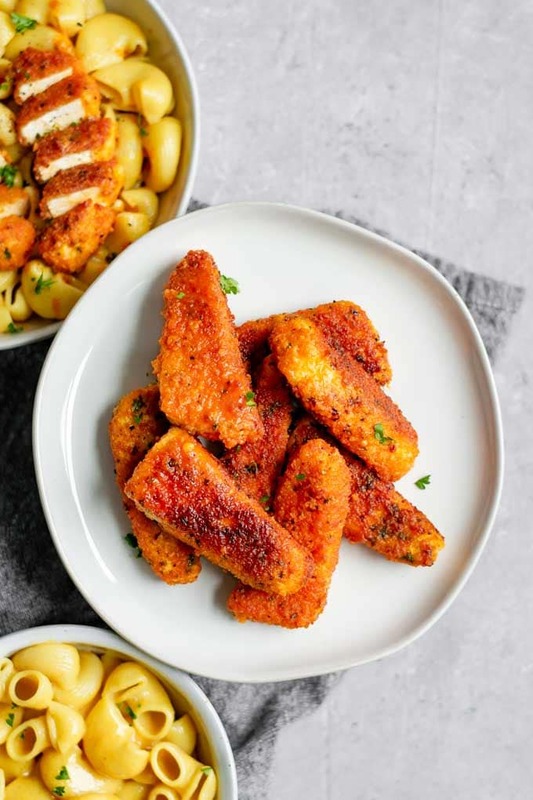 The panko is mixed with paprika for a peppery flavor, fresh minced parsley for slightly bitter and bright notes, and salt and pepper for seasoning. Dip the tofu first in the tapioca starch to coat; the starch will naturally stick to the damp tofu, even after pressing. Next dip it in the plant milk, which will absorb into the starch to create a sticky coating. Lastly dip the tofu into the panko mixture. Set onto a baking tray, drizzle or spray with a little oil, then bake until nice and crispy! Toss in an easy 4 ingredient buffalo sauce (hot sauce, vegan butter, plus a pinch each of salt and garlic powder) right before serving. While the buffalo wings are baking, make your cheese sauce and noodles! I am obsessed with how easy the sauce is. No blender or fancy equipment needed, its pantry friendly, and comes together in a matter of minutes. Native Forest Organic Coconut Milk is the base for this cheesy sauce. It’s rich and velvety smooth, and turns into a mouth-watering mac and cheese. 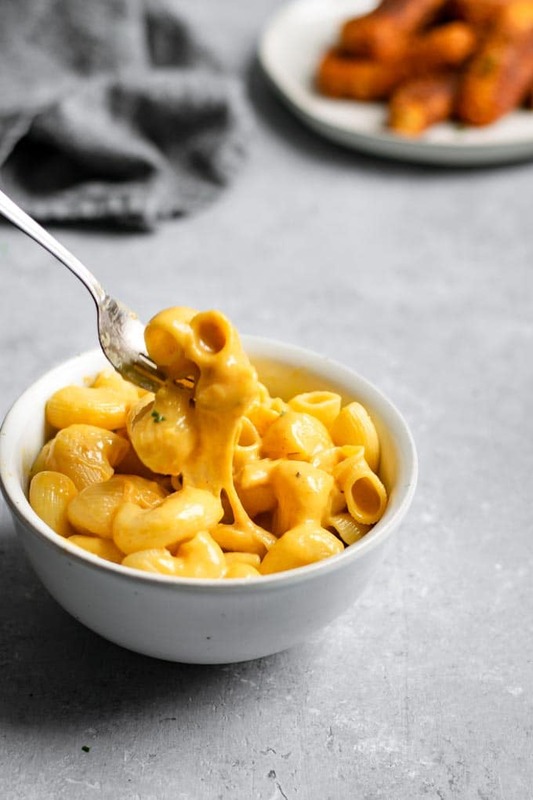 To make the cheese sauce, first mix with your choice of plain unsweetened plant milk, or if you’d like, a second can of coconut milk for a more decadent sauce. Either way it’s amazing! Whisked into the creamy base we have: nutritional yeast for cheesy, nutty flavor, smoked paprika to complement the smoky spicy buffalo tofu wings, onion and garlic powder to enhance the rich flavors, a bit of turmeric for its yellow color, and plenty of salt to counteract the natural sweetness of coconut milk and because cheese is salty. Next we have a somewhat odd sounding ingredient, but bear with me. Coconut vinegar (you can also substitute apple cider vinegar) cuts down on the coconutty flavor and gives some of the sharpness and acidity that cheese has. A splash of vinegar is my favorite hack for making vegan cheese and cheesy sauces. Lastly mix in Let’s Do Organic Tapioca Starch, which thickens the sauce and gives it the unique stretchy quality. 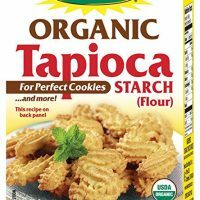 Tapioca starch isn’t as fussy as say cornstarch, so usually will whisk in without clumping, but to be safe you can first mix it into a quarter cup of the milk before adding it into the pot. To finish the sauce all you do is bring it to a simmer and let is bubble away for a few minutes until the starch activates and cooks and the sauce is thickened. 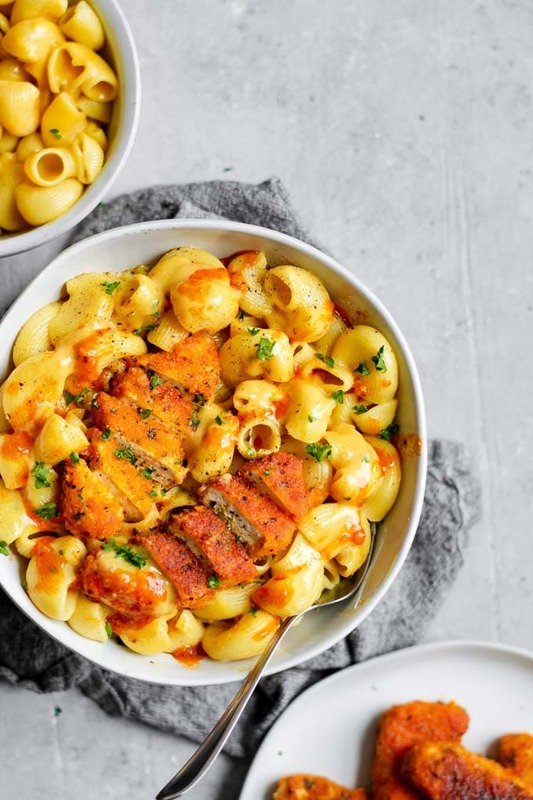 Mix with cooked pasta and you’ve got your mac and cheese! So, so good. Last comes the best part! 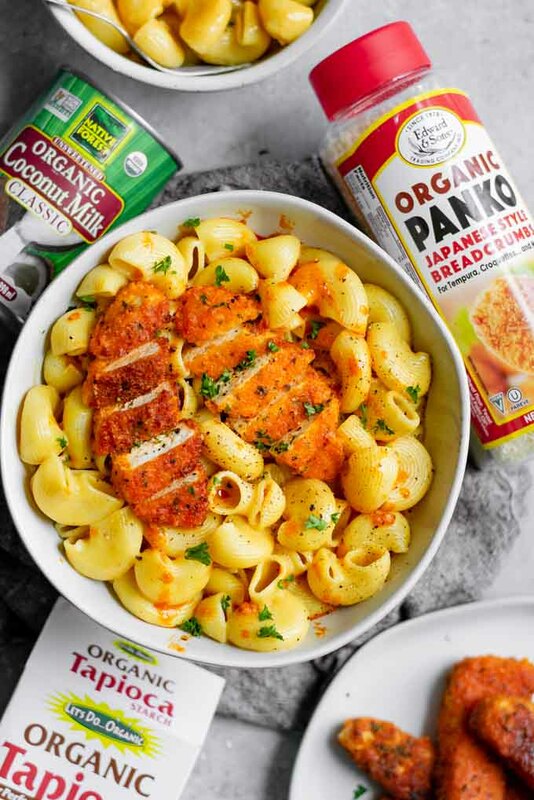 Serve your coconut milk mac and cheese, place a buffalo tofu wing or two over your serving of cheesy noodles, drizzle on a little extra buffalo sauce or hot sauce and enjoy! Make sure to repeat as often as possible 😛 . You can take the recipe next level by adding a little vegan ranch or bleu cheese dressing over the wings. No one will complain, trust me. Thank you to Edward & Son’s for sponsoring this recipe! 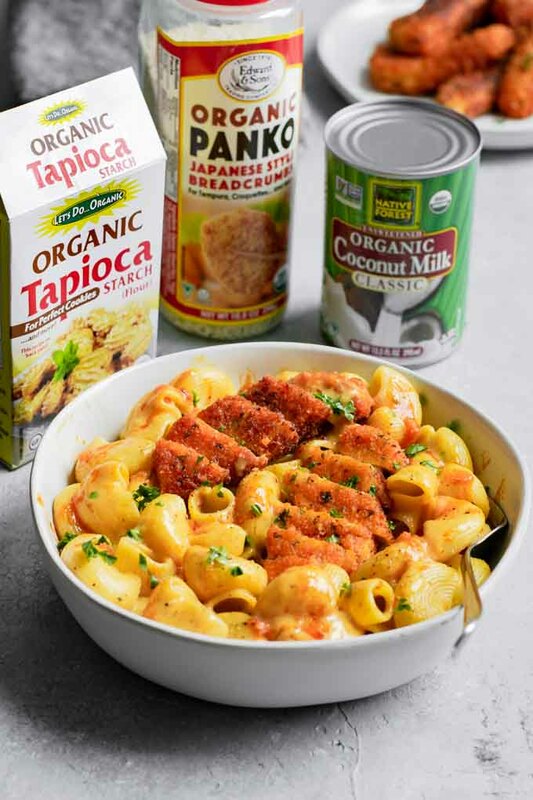 If you make this vegan buffalo wing mac and cheese, leave a comment below and rate the recipe on the recipe card. And please share your photos with me on Instagram, tag @thecuriouschickpea and #thecuriouschickpea, I love seeing your creations! Looks delicious and sounds so easy? Can you just use flour to thicken cheese sauce? Hi Erica, the tapioca starch in the recipe thickens the sauce as well as gives it the stretchy texture! No need to add flour 😊. This recipe looks amazing! 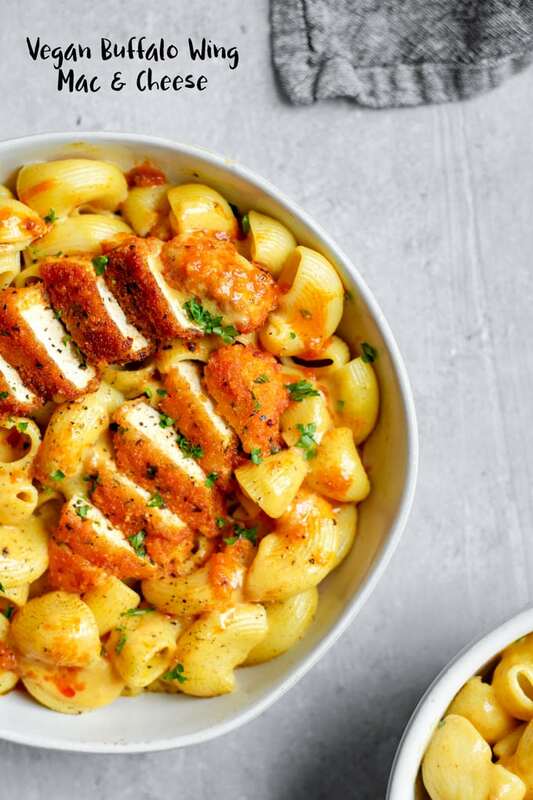 The creamy mac and cheese with the crunchy tofu wings plus that hit of spice…. I can’t wait to make (and EAT) this! Thank you so much Laurel! I’m such a big fan of this combo! This looks om nom nom amazing, thank you for sharing. I’m happy that you chose to use tofu for the wings rather than cauliflower. I’m glad you like it! I’m a big cauliflower lover and a big tofu lover, but the tofu wings just pair so well with the creamy mac! I tried only the coconut milk mac & cheese part of this recipe last night, just to test it out. It was absolutely fantastic! My teenage boys took second helpings,which, of course, is the true measure of success! 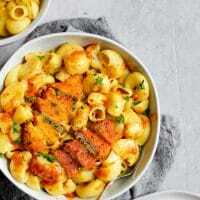 I have tried nut based mac & cheese recipes that I thought were okay, but none of them really “wowed” me – yours totally does! I will definitely make the entire recipe next time but now I know that your recipe is absolutely going to be my “go to” recipe for macaroni and cheese! Thank you! Hi Carolyn, I’m so glad you and your boys enjoyed the recipe so much! Thank you for reporting back! Mmmmm this was so, so good! I would not have thought that mac and cheese could taste like this with coconut milk, wow. 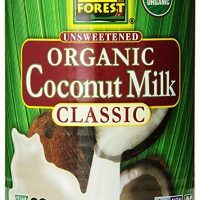 I followed pretty much exactly but we were low on plant milk so I just filled the empty coconut milk can with some of the pasta cooking water and splashed that in instead. Worked great. Delicious with loads of freshly ground black pepper. We also loved sprinkling the top with the little bits of spicy Panko that were left at the bottom of the bowl after tossing the tofu wings in the hot sauce. Thank you! That sounds amazing, can’t get enough of that buffalo panko! I’m so glad you enjoyed the recipe Lucy! This mac and cheese was a huge hit here!. My son LOVED it! Thanks for the recipe. Woohoo! I’m glad you all enjoyed it!